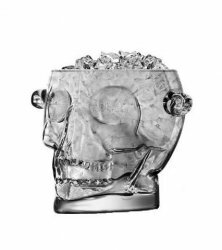 Make no bones about it, the Skull Ice Bucket is a very unique piece! Made of thick clear glass, the ice bucket is also designed with handles for easy use. Whether your next themed party is gothic, theatrical or a huge Halloween bash, the Skull Ice Bucket is the perfect centerpiece!